You can do a multitude of things with NFC that could really change the way we go about daily tasks, as well as creating new forms of behaviour. Not going to rant off again about the possibilities, but one new way it’s being used is to order taxis. 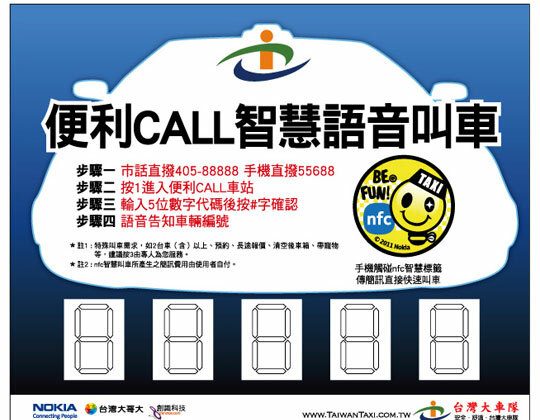 Nokia together with Taiwan Taxi set up a NFC booking system. Tapping the Taiwan Taxi poster allowed the phone to send a SMS to the company. This booked both a taxi for that location, confirmed 15 seconds later by SMS. This is fantastic. Say you don’t know where you are, or you don’t have the number of a taxi firm and there aren’t that many taxis going past for you to flag down. This takes out that hassle. Just tap and a taxi appears. Of course, it’s possible that folks might abuse that system, but then again, they could do the same with a phone call. Unlike phonecalls though, SMS can be tracked and blocked easily. Launching with Taiwan Taxi, there’s gonna be 15,000 locations for you to book a taxi from. It would also be pretty cool if you could even make the taxi payment with NFC. I wonder if that would let you leave a tip. Is the location embedded in the poster? What if someone moves one poster to another location? Does the phone automatically send SMS? What if someone creates a NFC poster that makes you sign up to a premium service?